It’s around this time every year that the smell of the fall air and the feel of the slight, rustling breezes take me back to my high school cross-country seasons. I’m not exactly sure why this is, since much of the season was spent running many miles in sweltering heat. Looking back, I’m not sure how any of us survived! I remember running once in a summer lightning storm, for crying out loud. Of course, once the thunder subsided, the sensation of running in the pouring rain was something I’ll never forget. Attempting to write a blog on all four cross-country seasons would be an impossible task for me, so I’ll start with my freshman year and see how it flows. -Coach Thrasher promising us we could ride the paddle boats at Grassy Pond “one day.” This was his empty promise that he’d throw around when he wanted us to behave or not talk back to him, from what I recall. -Staying in the most ghetto Motel 6 known to man on our first away meet, which I believe was in Columbus “The Armpit of the State,” GA. I don’t think I’ve ever stayed in another Motel 6, and probably won’t ever again if I can help it. -Ben Chatraw singing the theme song from ‘The Gambler’ as he ran. I never understood how he could run and sing. -Doing intervals up the brutal hill by Coach Thrasher’s Old Wood Valley house. He never invited us in, oddly enough. -Selling Krispy Kreme donuts for our fundraiser. I’ve never eaten so many donuts in my whole life. -Leaving William Williams at Hardee’s and having to turn around on the interstate to go back and get him. Thrasher was beyond mad. -Getting my book bag stolen during practice in the first couple of weeks of the season. This is when we still ran on campus most of the time. -Riding the “prison bus” (as seen in the pic, behind us) down to Cypress Lakes for most of our practices. This was like the FFA bus or something, and for whatever reason it only had about half the seats in it. In the back half of the bus, there was a cage that took up one whole side of the bus. I never got locked in there, thankfully, but a few kids did. Coach Thrasher let Marty Kirkland drive the bus up the big hill on our cross-country course one year, and I still to this day can’t believe what a poor decision that was on his part. -Winning the region meet. For some reason, I remember very little about this. I’m pretty sure we had it in the bag, but I remember nothing about the meet. -When we were training for the state meet, Thrasher had us drink this syrupy purple drink that was served well, well, well above room temperature. I remember almost wanting to throw it up, but he told us we better not because it was expensive stuff. -Staying at the Jameson Inn in Carrollton, GA and walking over to the course on the morning of the state meet. I placed next to last in the state meet; something mentally got the best of me and I lost all focus in the race. We ended up placing 10th (my individual placing didn’t count, as I was the alternate). -Telling our waitress at Shoney’s on one of our trips that it was Thrasher’s birthday, so that she’d bring him cake and ice cream. He was beyond furious with all of us. -Thrasher’s “treat” after all four state meets I went to in Carrollton was to take all us kids to downtown Atlanta and walk us through all the big hotels. Free entertainment much? At the time, I thought this was the coolest thing ever. We always ate at the Hard Rock as well. There’s many more memories I’m sure I’ll recall once I post this, but those are the main ones that come to mind. Now for the feature presentation…Coach Thrasher had pretty much single-handedly mapped out this very hilly 5K course on some borrowed land adjoining the Cypress Lakes subdivision in Lake Park. He mowed out the trails with a tractor, measured it for accuracy with his old Dodge Charger, yadda yadda yadda. Keep in mind this wasn’t *his* land–the developer was just letting us use it to run on. One afternoon towards the very end of practice, we were all walking around in cool-down mode and he started hollering for all of us to get on the prison bus. We thought he was playing a joke, but then he started yelling, “Get on the dang bus!” quite furiously and we knew he wasn’t kidding. No sooner had the last kid half-way jumped on the bus than he literally FLOORED the old jalopy towards the woods bordering the grassland of the cross-country course. We asked him what was going on and he told us to shut up. (I might be imagining that part, but it sounds like something he would’ve said.) In the distance one of us spotted two kids on four-wheelers, so we figured out he was in hot pursuit of them. As if riding in a rickety school bus over hidden potholes in the waist-high grass wasn’t torture enough, once we entered the woods it was every man for himself. Tree limbs whipping in and out the open windows; leaves and pine needles flying mid-air through the bus; one kid hollering how a branch hit them in the face because he/she didn’t stealthily ducked down like the rest of us. I’ve never felt so close to a war zone! Finally, the prison bus ground to a halt and we looked out the front to see these two, pre-teen boys paralyzed with fear on their four-wheelers. Thrasher gave them a tongue-lashing about how he better not catch them on *his* course again. If they weren’t about to cry because of him yelling at them, they were about to cry or wet their pants from being chased through the woods by a school bus! (Can you imagine what was going on in their heads? Seriously?) I’m not even sure at this point if we reversed all the way back through the woods or what, but he never wanted to talk about what happened. Being teenagers, we tried to get him to tell the story to our parents at our end-of-the-season banquet, but he totally brushed us all off. Classic Thrasher. So yeah, it’s these and a plethora of other memories that come rushing back into my head when the intoxicating fall air takes a hold of me. 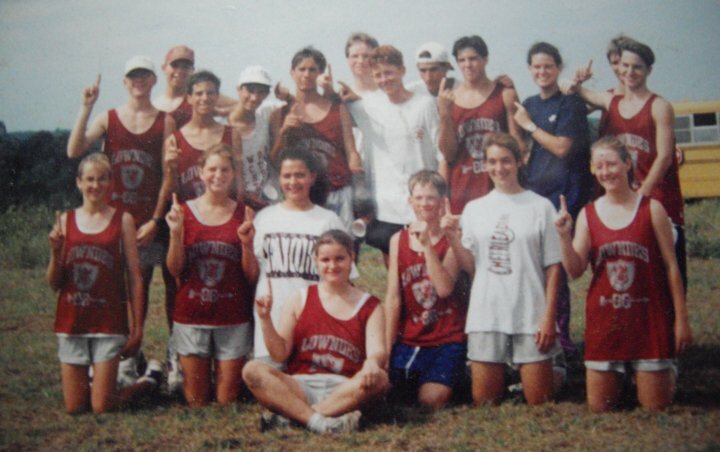 Being a part of the cross-country team was undoubtedly my best experience in high school. I’m still so proud of my letter jacket that I keep it in a closet at my parents’ house, in case my own dwelling were to burn down. (As if theirs also couldn’t burn down, heaven forbid. I’m not sure what my logic is there.) I wish I had more candid pics to share, especially the side profile one of me where I’m about 25 lbs skinnier than I am now. (How could I lose that one?!?) To this day, if and when I muster up the motivation to jog, I prefer to do it outside on a grassy surface. I still have some of the same Umbros that I wore to practice all throughout high school. And, of course, I have the team T-shirt from the ’94 season. Maybe, just maybe, things haven’t changed all that much in 17 years. IWDAICTMLHSCCTSC. Never having thought that Brian Tucker ever really ran up to his potential, though he was pretty good. I am now convinced that Brian ran so hard that his brain suffered from oxygen depletion and lost its ability to comprehend the reality of the moment. It obviously had deleterious long-term effects also since his recollection of events is somewhat distorted. I plead guilty to most of the details of the school bus chase, though we never got close enough to even see them after the initial after the initial sighting, but finally did corner the two perpetrators in an adjacent subdivision. I guess most of the other stuff was true, but if the old bus ever went up Hell’s Hills with Marty Kirkland driving he must have stolen it. Wouldn’t have put that past almost any of the group. What Brian does significantly omits is the time out of over one hundred runners in Lake City, he was the only one who failed to jump a water/mud hole during a meet and went completely under, rising later on to finish the race covered in mud. What I remember most about this team was the camaraderie and talent that allowed them to win more than one region championship. Though they never knew it and I’ll never say it, I loved them all. Thanks Brian for reminding me. On a lone summer’s eve, on a train bound for nowhere, I met up with the gambler, we were both too tired to sleep…. You made my night Brian. Thank you for this. The only thing you left out of the 4w story is that it turned out the two kids had permission from the land owner to be riding there. And Coach Thrasher, I’m so sorry I did not mention the team in my graduation speech….my biggest regret from high school. Thank you for making my Senior Year.